The YMCA was established in 1844 and is the largest and oldest youth charity in the world, currently helping over 58 million people in 119 countries. The YMCA was founded by George Williams, a draper from Somerset, who was appalled by the general conditions for young working men who had moved to London. His aim was to put Christian principles into practice by developing a healthy “body, mind and spirit”. These three angles are reflected by the different sides of the (red) triangle—a logo still very much associated with the YMCA today. 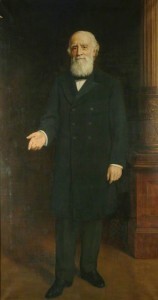 George Williams was knighted by Queen Victoria in 1894. After his death in 1905, he was commemorated by a stained-glass window in the nave of Westminster Abbey. Sir George Williams is buried in St. Paul’s Cathedral. He also gave his name to the YMCA George Williams College, which is regarded today as one of the foremost trainers of youth workers in the world. The YMCA spread at a rapid rate in its early years, and by 1851 was already established in the USA and Canada. The YMCA was very influential during these formative years, during which the organisation successfully promoted evangelical Christianity in weekday and Sunday services. The YMCA opened its first holiday camp in the 1870s, using a model on which Billy Butlin later modelled his holiday camps. The YMCA was most famous for the development of its gyms during this period; as well as promoting good sportsmanship through athletic contests in gyms and swimming pools, the organization also invented basketball and volleyball along the way! The Boy Scouts movement also began in the Birkenhead and Nottingham YMCAs. YMCA Port Talbot was first established in 1898 and was known as the Aberavon and Port Talbot District YMCA. At first it was run from a corrugated iron and wooden shack within the area of Aberavon; there were also tennis courts and some land that was used for athletics and other sports. YMCA Port Talbot grew from these humble beginnings, and is still supporting the local community in the 21st Century. In the early days, YMCA Port Talbot encouraged the ethos of the YMCA movement: Mind, Body and Spirit. The Christian faith was at the centre of all the work the Aberavon and Port Talbot District YMCA carried out, and included providing Bible reading classes, not only within the YMCA, but also within the local Hospital and Schools. Along with this faith, sport was also very important. 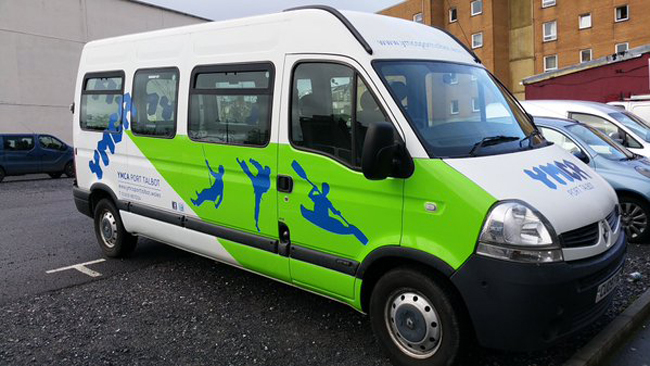 Aberavon and Port Talbot District set up athletics, football, snooker, rugby, cricket and shooting clubs. These sports were used to encourage the youth of the time to participate as team members and individuals. The aim was to help develop the skills needed for adulthood. The pages of the Port Talbot Guardian were full of the sporting achievements of YMCA Port Talbot in the 1930s! During World War 1 the role of YMCA as a whole changed, and perhaps this is what it is most famous for today. The YMCA really did support the troops and was even thanked by the King when presenting an OBE to the National Secretary, Arthur Yapp, in 1917. The King said that he had “seen our Y.M.C.A. huts all over the country and had visited our centres right up the line on the Western Front.” The King added, “You have placed the whole Empire under a debt to you.” YMCA huts provided soldiers with food and a place to rest on the frontline, or at home in military camps and railway stations. The YMCA embarked on a massive education programme for soldiers, which eventually becomes the Army Education Corps. The red poppy was introduced by an American YMCA worker and went on to become a worldwide symbol of remembrance for those lost in the World Wars. In Port Talbot, local troops were provided with much needed support in both their duty and on their return home. Support was also offered to families who had lost a father, brother or son. 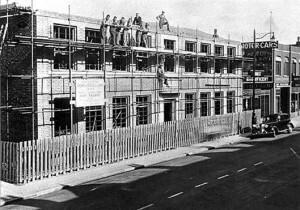 Funds were raised to aid relief work in war-torn Europe, and Port Talbot’s buildings were used to house returning troops. After the First World War, Aberavon and Port Talbot District changed its name to Port Talbot YMCA (it is thought this name change coincided with Port Talbot becoming the agreed name for the borough). The work of Port Talbot YMCA continued as before the War, providing sports facilities and helping the needy within the community. Following the outbreak of the Second World War, Port Talbot YMCA relocated in 1940, moving from its previous old shack into a purpose-built building in Talbot Road with its own chapel. We still occupy the same buildings today. As in World War 1, Port Talbot YMCA played a major part in supporting the community, the services and the auxiliary services during the Second World War. Troops on leave were provided with free food, guidance, cigarettes and also a place to stay if they were passing through. After the withdrawal from Dunkirk, Port Talbot YMCA housed many troops in the old building, in which the troops were provided with beds, hot food and the comfort of the Christian faith. Port Talbot was a prime target for German bombers, with its steel works and oil refinery. During one air raid, Port Talbot YMCA threw open its doors to the local community to safeguard them from danger. 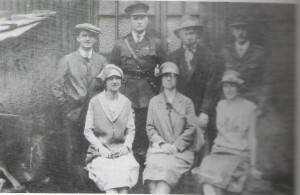 During this very testing time Port Talbot YMCA provided the local police, fire service, home guard and air raid wardens with a base to work from 24 hours a day. A YMCA Women’s Auxiliary Service was also established, which ran the café and provide all aspects of comfort for the youth and mothers of the area. The YMCA played a vital part in the war effort, just as it had in the First World War. Port Talbot YMCA raised a substantial amount of funds for a tea car, which served food and drinks to troops on the front line. The YMCA again established huts to be used by troops during their time of rest, so they were able to receive food and drink and have a place to write home, spend time in reflective prayer or simply relax. Port Talbot YMCA raised £1000 to help rebuild London YMCA after it was destroyed during bombing. In 1949 the YMCA presented its Order of the Red Triangle to Port Talbot YMCA in recognition of the wartime service provided to soldiers and the community. For the people of Port Talbot the YMCA is most fondly remembered for its Friday night dances, when young couples would dance the night away to the sounds of the Big Bands. 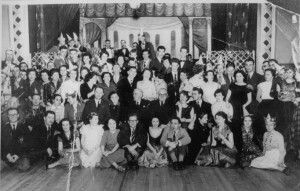 It was at these dances that a lot of the area’s postwar romances started! Port Talbot YMCA Dramatic Company ran for many years and put on countless plays, such as King Lear and Othello. The Dramatic Company was regarded as an experienced company, entering five drama competitions in 1932 alone. The stage boards were graced by many local actors, among them Sir Anthony Hopkins and Richard Burton. There were snooker rooms and a prayer room in the YMCA building, as well as a thriving youth club attended by many of the Port Talbot youngsters on a regular basis. As society changed during the 1960s, so did the role of Port Talbot YMCA. The dances became less popular and the dramatic company’s activities came to an end. The sports clubs had also moved on; for instance, the Athletics Club (which had been based in the YMCA since the club was founded in 1921) became Port Talbot Harriers. Today, we still strive to help the less fortunate in society. Since 1989 Port Talbot YMCA has been a hostel, providing accommodation to young homeless men in the area. A new hostel, Sir Anthony Hopkins House, was added in the early 1990s and we now have 14 purpose-built single rooms. Many hundreds of young men have stayed in Port Talbot YMCA in recent years. 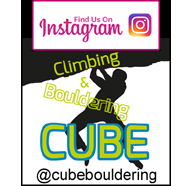 Our facilities have also been improved, with the recent addition of a music practice room and recording studio, martial arts dojo and a very high standard climbing wall. Many local fitness and exercise groups regularly use our hall and sporting facilities.